Medicine and Technology: Tragic Story: Philip Markoff, the Craigslist Killer? 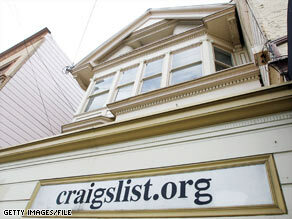 Tragic Story: Philip Markoff, the Craigslist Killer? As someone who spent 4 years in Boston at MIT, this sad story hits home for me. A Boston University medical student named Philip Markoff has been charged with the murder of Julissa Brisman, a 26-year-old masseuse who advertised on craigslist. I've used craigslist for many things: to buy and sell merchandise, to find job candidates, and much more. It's a great service and there are some people who offer (or sell) their services online. I'm sure this isn't the last time we're going to hear about Philip Markoff. He was charged today and he plead "not guilty" so we'll have to see where this goes. He's currently being held without bail for the fatal shooting of Brisman. This story makes me think about television shows like CSI. I don't usually watch TV unless I'm at the gym. I admit that I'll watch CSI if I'm running on the treadmill or using the eliptical. Without a doubt, medical technology has improved our ability to solve crimes by analyzing biological evidence. Let's hope that the evidence leads to the correct diagnosis of this criminal case.